Our ground level Kiahuna Ocean View unit in building 20 is a favorite for it's expanse of lawn leading from the lanai to the beach. It's very a quiet and private part of Kiahuna, which is why many prefer this area to any other on the property. Just to the east is a picturesque view of the twin bridge, a charming feature occasionally favored as a wedding site. New carpet, cabinetry, and Ceasarstone quartz kitchen counters make the unit feel fresh and bright. Most recently we have added a new walk-in shower. Free WIFI in and around the unit. Note: There is a check out cleaning fee collected upon departure (currently $160). We have been coming to Kiahuna since the 1980s. After exploring Maui and Big Island resorts, we decided nothing compared with Kauai and Kiahuna. The relaxed atmosphere, beautiful gardens, lovely beach, and plantation style architecture all add up to one of the most unique properties in the Islands. This was our second time in this unit, and it was just as wonderful as last time. 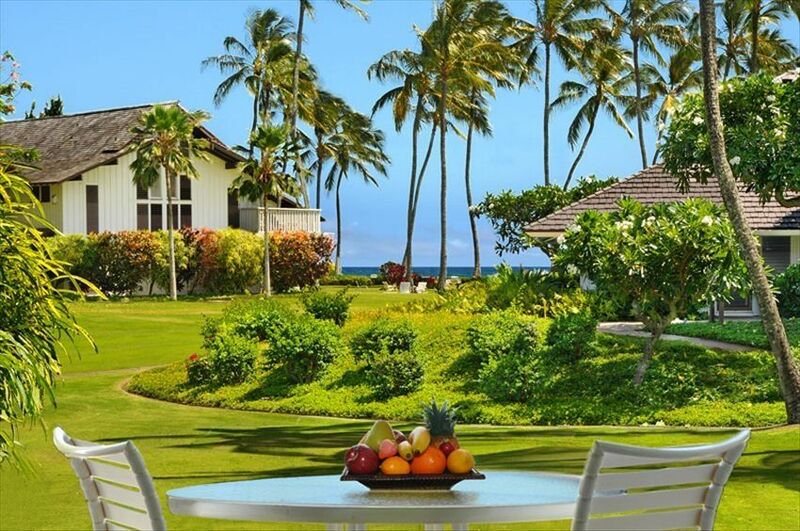 The location offers a gorgeous view and is a peaceful spot within Kiahuna Plantation. If you want an amazing experience but don’t need oceanfront, 134 is for you. We greatly enjoyed the great lawn out our front doors, the view, and the short walk to the beach. We had a very sweet time with the family and Kauai is one of our favorite places. The condo is comfortable, has what is needed, and was a nice place for a home base. The sounds of birds, flowers, and breezes were lovely through the slatted windows. Checking in with Castle was very easy - we would return. We loved our stay at #134. Just as we remembered it and better. Koloa Monday at 12:00. We got there early and were able to look around before it opened. We enjoyed Mai Tai's at the Marriott. Fun to watch a surfer dad with his 3 year old son. We also enjoyed a two hour tour of the Grove Farm Plantation. Beautiful gardens and a lovely setting. It was fun to see the inside of the house and all the collections. We had tea and cookies in the kitchen. Our tour lady showed us all her pots and pans. She told us that our smile is unique to each of us and we should show it often. Very sweet ! The unit was well cared for and clean. I would definitely recommend to friend. We had a fantastic time in Kauai! We loved the Kiahuna Plantation and the condo, and felt they were the best place to stay on the south shore. We went snorkeling at Poipu Beach in the morning (a monk seal or two were always there), then did some sightseeing in the afternoon. Some of our favorite things were seeing Waimea Canyon, hiking along the cliffs beginning at Shipwreck Beach, and taking a catamaran sunset trip to Na Pali. We used Blue Dolphin and the crew was fantastic! We got lucky on that trip and saw a mother whale and her calf less than 50 feet from the boat! It was definitely one of the highlights of our vacation. The next time we come back to Kauai, we definitely will stay here again! We loved it as it was in the perfect location for us to enjoy the sights and beauty of the island. Thank you for making our stay so special! Our stay was perfect. We both loved Kauai and the condo and complex were fabulous. The location is excellent for exploring the Island and the people at Castle Resorts very attentive and accommodating. They do a fabulous job of keeping the grounds and barbecues in pristine shape. We saw as much of the Island as we could while still taking a few days to kick back around Poipu and Old Koloa. Waimea Canyon, Polihale State Park, the east and north shores as far as one can drive, farmers markets, art night on Friday in Hanapepe and a Napali Coast catamaran tour were all highlights for us. What breath taking scenery and waves. We enjoyed a beautiful sunset one evening on the beach in front of the complex with a bottle of sparkling wine, lifting our feet when the waves came up under our chairs. Kalapaki Joes has good appetizers at happy hour, great lunch at Hanalei Gourmet and my husband fell in love the lemongrass martini at Keoki's Paradise. The Koloa Fish Market is a gem for local fish. We bought monchong one night and moonfish another which was a real treat. I'm so glad we picked your condo out of the thousands of choices on the internet. It was a real pleasure to deal with you and to find that everything was just as you say on your website. We hope to return to Kauai one day. There is a one time check out cleaning fee, currently $120, collected by our onsite management.